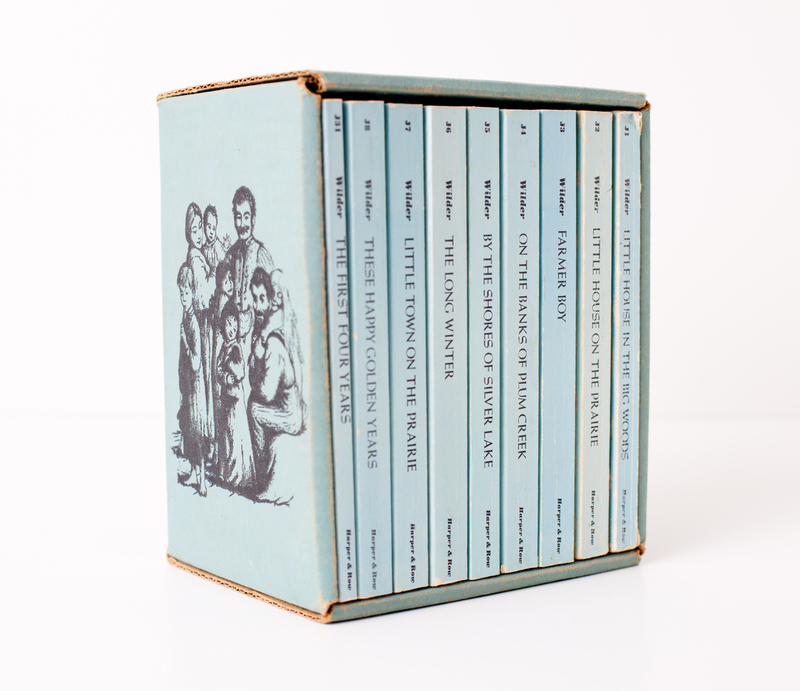 A complete nine-book boxed set of Laura Ingalls Wilder's classic Little House series. This version is a first edition set from Harper Trophy Books in 1971. “Can you believe the news about Laura Ingalls Wilder?” “Is nothing sacred?” “Aren’t you so outraged?” The texts and emails to me, a self-described Laura superfan, started flowing in as soon as the Association for Library Services to Children announced they were changing the name of the Laura Ingalls Wilder Award, a prestigious children’s literature honor, because of racist attitudes toward indigenous peoples in her books. As a young reader I found the story of the Ingalls’ life on the prairie and their grit, resourcefulness and commitment to family life laudable. I still do. Which might make it surprising that I agree with the decision by the A.L.S.C. to drop Wilder’s name from their award. My husband, who did not grow up reading the series, had a very different experience encountering them as an adult. We started listening to the audiobooks on family trips and there were many moments when he would turn to me with a shocked expression at what we were hearing. He then proceeded to pause the story to give an explanation to our children about the racist statements the characters made and the injustice of what actually happened to Native Americans—things I did not pick up on as an 8-year-old reader. We should not set classic works aside merely because they make us uncomfortable. These racist comments did not deter my husband from reading the entire series aloud to our kids. He emphasized the themes that make the stories valuable to our family, such as growing our own food in our backyard, spending time together and pursuing simple living. There is much good to glean from the series, but reading it with our children has required having some difficult conversations. Just because we have fond affection for a literary work does not mean we can ignore themes that sentimentalize injustice. In many ways Wilder’s books create a founding story that answers questions about how our country came to be and who we are as Americans. But despite including characters that are based on historical people, the series perpetuates a myth that is more than just “dated” or “problematic.” While we can perhaps explain away Ma Ingall’s ignorance and fear of Native Americans, it is much harder to dismiss Pa’s eager willingness to knowingly steal their land when his actions are framed as noble and heroic westward expansion. Just because we have fond affection for a literary work does not mean we can ignore themes that deny the personhood of certain groups or sentimentalize injustice. Can Canadian Catholics reconcile after “whitewashing” indigenous Catholics? Had the A.L.S.C. promoted a ban or censorship of Wilder’s books, I would be protesting with the strings of my sunbonnet blowing in the winds of my rage. But that is not what happened. The statement about the name change emphasized that the decision did not in any way mean that the books should stop being read. And the A.L.S.C. did not choose to strip Wilder posthumously of her award (she was the first to be honored with it in 1954). I will keep reading Wilder’s books with my children and continue having conversations with them about what virtues the Ingalls family hold that are worthy of emulation (and there are many) as well as how this story fits into the tragic American story of injustice against Native Americans. There are many things about Laura Ingalls Wilder that make her a personal hero of mine; but that does not mean I can ignore the racism in her books or close my ears when groups injured by the myths she perpetuates demand that we reassess how we interact with these texts. These are not books to toss at an 8-year-old without walking alongside her to have serious discussions about what actually happened in the history of our country. If the renaming of this award forces even just a few people to reexamine Wilder’s books with a more critical eye, it will have been worth it. to anyone reading them a century later. allow stories that reflect how flawed and limited in their thinking humans are. you are absolutely right! The ALCS have condemned the author for her characters' prejudices---what nonsense. This is like the controversy over "cultural appropriation" that won't let white folk write about black characters in their fiction. And this is a Library Association that is changing awards and honors because a book about a particular time does not meet today's PC standards? What next?--will the ALCS start burning its own books? This prejudice against Wilder is censorship pure and simple, and it is outrageous that it is coming from an association that claims to uphold the value of books, literacy, and access to knowledge. Authors beware--the Thought Police are watching you! Wonder if ALCS still keeps George Orwell on its shelves? you will not be enriching their development--instead you will be placing a monkey on their shoulders to police their reading. There is no censorship. Did you actually read the statement by the ALCS that was linked in the article? All they are doing is changing the name of their award from the Laura Ingalls Wilder Award to the Children's Literature Legacy Award. They are not banning Wilder's books. They are not even taking away the award given her in 1954. They named the award in her honor, and then they decided to rename it. They get to do that. They get to decide what to name the award they freely give to authors. They are in no way suggesting a ban, a boycott, or anything of the sort. Furthermore, you misuse the word "prejudice". There was no pre-judgement. They formed a task force that studied the issue and made a recommendation. Again, it's their award, and they call it as they please, or stop giving it out altogether, etc. And then you write, "..if you start sanitizing literature to conform to today's prejudices...". The equality of the Native American or the African American to the White American is not a prejudice; it's a principle on which our country is founded, that "all men are created equal". Furthermore, not once did Stewart suggest that Wilder's books should be sanitized, bowdlerized, or otherwise altered in any way, shape, or form. Stop overreacting. Nobody's burning books, banning books, expurgating books, etc. Someone notices racism and calls it out, but keeps reading the book to her children. An organization renames an award that they created. That's it. silly me for misreading the whole article. This whole exercise by ALCS was just as benign as rearranging the deck chairs on the Titanic, right? If it was all so innocent, why go to all the trouble in the first place? This action is historical revisionism, whether it is taking down statues in the South, or banning emblems at Harvard Law School-- it is sanitizing our history, in case some anonymous person somewhere might take offence. I prefer to read real history, warts and all. "and the injustice of what actually happened to Native Americans"
The attitudes of these characters are surely influenced by what happened to innocent white setlers in western MN in the Dakota War of 1862, which was the largest act of terrorism in the US up to that point. The murders, rapes, and enslavements committed by Native Americans in this "war" must also be placed into context--the Native American (and racist) slogan that the "only good whiteman is a dead whiteman" is also relevant. A Native American great - great uncle was hung because of what occurred during the Dakota War of 1862. A great grandfather and two great-great Uncles were spared by Lincoln, but one of my great Uncles would never use pennies or accept 5 dollar bills in change because Lincoln allowed his father to be hung. At some point we do have to move on. you can be said to be holding a prejudice that serves no present purpose. This is a tricky matter since many well-known authors from the nineteenth and early twentieth centuries espoused more direct racist views (e.g., Jack London, Charlotte Perkins Gilman). How about in the more recent past (e.g. Amiri Baraka's anti-semitism)? There is a difference between a racist book/author and what is a fairly factual presentation of the social and economic reality that existed. LIW's intent was not to extol abuse or prejudice but to relate the story of what, for good or bad, was the way life was. To ban these books or disparage the author is absurd. How much better to use the stories for conversation and the development of critical thought. Did you actually read the article? Not once did Stewart suggest banning the books. Nor did the ALCS. Nor did Stewart disparage the author, but rather the racist content. Yes, the books are a reflection of their time; and Stewart acknowledged that. And in fact she and her husband did exactly what you suggested: "use the stories for conversation and the development of critical thought" with their children. The underlying question is why the subject of changing the Title of the ACLS Award ever even came up?.....take a guess! In your answer you will find the basis of the critique of their action. Thank you, Haley Stewart, for your thoughtful, insightful and just analysis. We make a big mistake when we conflate an award for excellence in literature with the statements of some of the characters within the literature. It would be different if the works were condoning or promoting racist attitudes toward Native Americans. It would also be more understandable if the writer were a notorious racist. But neither the work nor the writer expresses racism as commendable. from the award imputes guilt to her name and her works, even when the works are not “banned” outright nor “censored.” The implicit condemnation socially taints both her name and reputation and that of the wonderful literature she produced, which has been enjoyed by tens of thousands, if not millions — for generations. I don’t think any literature ought to just be handed to our children without discussing its contents— because there is too much of value which can be missed in so doing. Teachable content comes from both edifying passages in literature and ones we must treat with disapprobation or a better understanding of historical context. I appreciate the author's comments. I read the books along with my children and suffered at the comments about the Native population. We also did not ban the books but did talk about them. It is important to deal with the fact that many folks we love have and express opinions we can not espouse or even agree with. Haley Stewart is a writer, speaker, podcaster, beekeeper’s wife and mother of three. She blogs at Carrots for Michaelmas and is currently working on a book project for Ave Maria Press.